To start the year off I like to have the students research a disaster that changed the way the world interacts and shook the confidence we have in our world safety. 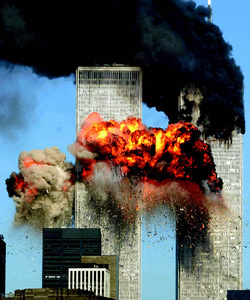 We will spend some classes examining the attack on the Twin Towers in New York City in September of 2001. I like to start here, because it is an engaging event that will quickly capture the attention of the students. As well, it provides me with an opportunity to get the students to log on to the school computers early in the year and iron out any wrinkles in this process. Finally, it incorporates the skills of reading, writing and media literacy to complete. This website provides a plethora of interesting stories ranging from biographies of famous personalities, sporting and historical events and a great deal more. I strongly encourage students and parents to explore the various tabs and rich story opportunities available to them on this website on their leisure time. I usually spend a few minutes briefly examining some of the story opportunities with the students to try and fire up their enthusiasm for the website. 2. They then open up the tab called "Disasters" and scroll down the page until they find a story entitled "America Attacked: 9/11." This takes the students to a page with a Table of Contents and 12 short chapters of reading material for them to peruse. What makes this website intriguing is that the authors have embedded certain materials into the story that assist struggling readers to comprehend the material. For example, words that are light green in colour (when clicked on) will take the students to a visual picture of what is being discussed. Words that are blue in colour link the students to newspaper/ magazine articles that help to clarify the word or phrase for them. Dark green words link the students to video coverage of the event. The computer provides the students with a phenomenal learning tool, and this website provides an opportunity to train students to further develop their research skill base. For example, when a student struggles to visualize a scene in a novel/ magazine article etc., the students can use a variety of search engines on the internet to find images and/or video that will help to clarify their understanding. Not all websites provide links for students, so training in how to use the internet is essential. This website provides a stepping stone to demonstrate to students how they can help their comprehension by a mere click of a button. Truly empowering stuff. The students will spend time dividing their English binders into organized components. They will have a divider labelled "Reading" in which they will include all materials that are related to this area of English. They will similarly label a divider for "Writing", "Language Convention Training (LCT)", "Oral/Visual Communication" and "Media Literarcy". If time permits, they will complete their first writing journal, that will be handed in before the end of the period so that I can get a sense of their independent writing abilities and styles.